A look at the figures just published by France’s Pôle Emploi job centre for the month of September 2015 shows that the number of job seekers who were registered and inactive (category A) has declined significantly (-23,800), following an increase in August (+20,000). While this is encouraging news, the decrease has to be compared with the increases seen in categories B and C (+25,600). So while employment has indeed picked up, this has not resulted in the numbers of people exiting unemployment as measured by the job centre, i.e. it has not put a stop to the continuing rise in the number of long-term unemployed (+10.4% in one year). Nevertheless, these trends do support the conclusions drawn from current analysis which indicate that a recovery has indeed begun. After seeing 76,000 jobs created in France in 2014 due to growth in non-commercial jobs, the first half of 2015 was marked by an increase in the workforce in the commercial sector (+26,000), which resulted in an acceleration of job creation in the economy overall (+45,000) over the first half of the year. The recently released statistics on employment confirm the accelerating trend in the third quarter of 2015: hence, over a year, declarations on job hires of over one month recorded by ACOSS rose by 3.7%, following 0.7% in the previous quarter. 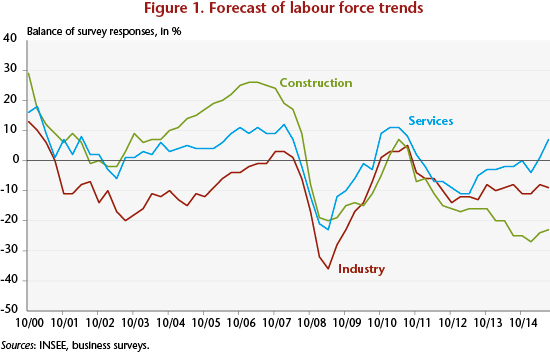 Business surveys also point to an increase in hiring intentions in the third quarter; these have turned positive in the service sector since the year started, which is also when the low point seen in construction was probably reached (see Figure 1). 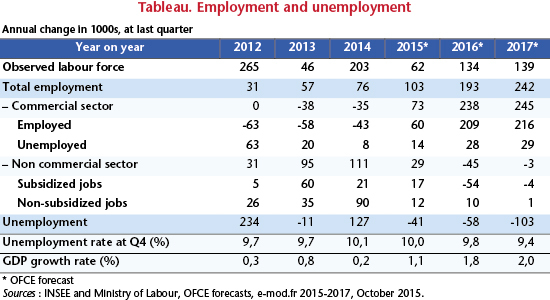 Our analysis of the labour market up to 2017, which was spelled out in the latest OFCE forecasts of October 2015, indicates that the commercial sector will continue to generate jobs up to the end of 2015 (+0.1% in the third and fourth quarters). The pace of job creation will nevertheless remain too low to foresee a fall in the unemployment rate by year end, particularly in light of our forecast for the GDP growth rate (0.3% in Q3 2015 and 0.4% in Q4) and the existence of overstaffing in companies, which we estimate at 100,000 in Q2 2015. The unemployment rate should remain stable at 10% until year end. With GDP growth of 1.8% in 2016, job creation will pick up markedly in the commercial sector once the overstaffing has been absorbed by companies, allowing the unemployment rate to fall starting in the second quarter of 2016. This decline will continue until the end of 2017. The last three years of weak growth have hurt employment in the commercial sector (-73,000 jobs between the start of 2012 and the end of 2014, cf. the Table). The strength of employment in the non-commercial sector, supported by the ramp-up of subsidized contracts (the “jobs for the future” programme and non-commercial job integration contracts) helped to offset the loss of commercial sector jobs, with total employment rising by 164,000 over the same period, which slowed the increase in the ILO unemployment rate: this figure for mainland France rose from 9% of the labour force in late 2011 to 10.1% at end 2014, i.e. a 1.1 point increase. 2015 is a year of transition, with a resumption of job creation in the commercial sector (+73,000 expected for the year as a whole) but less dynamic job creation in the non-commercial sector. For the full year, job creation will be boosted by the acceleration of growth (an annual average of +1.1% expected in 2015 but 1.4% yoy) and the implementation of policies to cut labour costs (CICE tax credit and the Responsibility Pact). The cumulative impact of the CICE and the Responsibility Pact, after taking into account the effect of financing, will create or save 42,000 jobs in 2015. However, job creation will be hampered by the presence of overstaffing: as economic activity picks up pace, companies typically absorb underutilized labour before increasing the volume of employment. As for the non-commercial sector, employment policy is continuing to support the labour market in 2015 through the increase in subsidized job contracts. This increase has nevertheless been slower than in previous years, with the number of “jobs for the future” contracts peaking in 2015 (Figure 2). Ultimately, total employment will increase by 103,000 in 2015, with the unemployment rate remaining stable at 10% till year end. For 2016 and 2017, the acceleration of growth (at respectively 1.8% and 2%) combined with the ongoing implementation of policies to cut labour costs and the closing of the productivity cycle in the course of 2016 will lead to accelerating job creation in the commercial sector. This will increase, year on year, to 238,000 in 2016 and 245,000 in 2017 for the commercial sector alone, a rate comparable to what was seen between mid-2010 and mid-2011 (234,000 jobs created). However, in 2016, the number of subsidized contracts in the non-commercial sector set out in the 2016 Finance Bill will be down from previous years (200,000 CUI-CAE jobs and 25,000 “jobs for the future” in 2016, compared with 270,000 and 65,000 respectively for 2015). 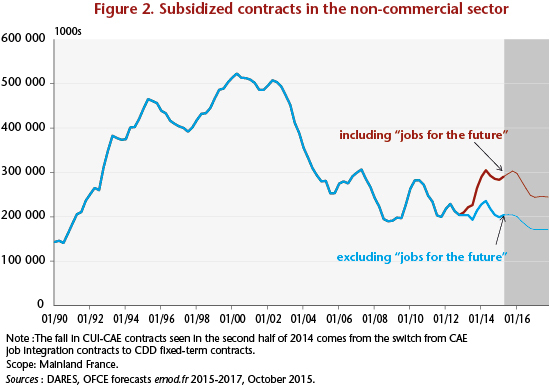 For 2017, we are assuming stability in the stock of subsidized non-commercial job contracts (see Figure 2). Overall, the long-term return of job creation by business will trigger a decline in the unemployment rate starting in the second quarter of 2016. Although sluggish, this fall should be sustainable, with the unemployment rate down to 9.8% of the labour force at end 2016 and 9.4% by end 2017. The presence of overstaffing in businesses derives from the gap between labour productivity and its long-term trend, called the productivity cycle. This reflects the time employment takes to adjust to economic activity. See Ducoudré and Plane, 2015, « Les demandes de facteurs de production en France » [The demand for production factors in France], Revue de l’OFCE, no.142.